Visible Ink Press : Whose comic book adventures in the 1960s were often interpreted by fans to be thinly veiled LSD trips? Whose comic book adventures in the 1960s were often interpreted by fans to be thinly veiled LSD trips? Before he became a superhero, he was a neurosurgeon. He gains his powers in Tibet after studying with the "Ancient One." His home base is in Greenwich Village, New York. Most of his adventures involve battling creatures from other dimensions. What started as a small backup strip, in a 1963 issue of Strange Tales #110, soon blossomed into one of the cult characters of the decade--one who has been a cornerstone of the Marvel Comics universe ever since. Magicians had been a staple of comics ever since Mandrake in the comic strips of the 1930s and Zatara in Action Comics #1, but Doctor Strange potently mixed his sorcery with the energy of superheroes to create something unique. His origin story, however, could have come out of the pulps: Vain, egotistical neurosurgeon Stephen Strange injures his hands in a car crash and winds up on skid row with the other outcasts. In a last-ditch search for salvation, he travels to Tibet to find the fabled "Ancient One," who he hopes will heal his hands. On finding the old sage, he becomes his acolyte and (as each cover proudly proclaimed) "Master of the Mystic Arts!" 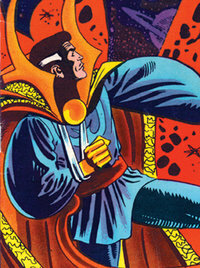 Under writer Stan Lee and artist Steve Ditko, Doctor Strange was a strip unlike any other, as the hero traveled to other dimensions and fought unique villains like Nightmare, Eternity, and the dread Dormammu. References to such wonders as the Eye of Agamotto and the Great Book of the Vishanti hinted at almost unimaginable wonders. Lee kept the stories punchy, exciting, and enjoyably florid, while Ditko summoned up inventive images and unique visions that still look innovative today. Doctor Strange, his acolyte and girlfriend Clea, and faithful servant Wong operated out of their Gothic "sanctum sanctorum" in the heart of New York City's Greenwich Village, soon to be the epicenter of the city's emerging counterculture. By the time of 1967's "Summer of Love," the Doctor Strange strip had been widely adopted by the hippy movement, and its spells and alternate realities were widely believed to resemble LSD trips. Strange appeared on Filmore Ballroom concert posters and even on the covers of Pink Floyd albums. He was, in effect, the psychedelic superhero--except, of course, his creators were middle-aged professionals with years of comics work behind them, and Ditko in particular was known for his conservative views and distrust of hippies. In 1968, despite Ditko's departure, Doctor Strange was given his own title. His new artist, Gene Colan, produced hallucinatory layouts that were even more experimental than his predecessor's. There was a brief, last-ditch attempt to make Strange more superhero-like by giving him a mask, but it would appear that the character was becoming too far-out for a mass audience. Rather than have a useful character languish in obscurity, Strange was eventually teamed with those other Marvel nonconformists, the Hulk and the Sub-Mariner, as the Defenders. Throughout the 1970s, and intermittently ever since, the Defenders have been a newsstand staple, and with Doctor Strange taking a leading role, interest in the sorcerer was rekindled. Initially in Marvel Premiere and then (from 1974 onward) once again in his own comic, Doctor Strange was used by new writer Steve Englehart as a vehicle to explore the interest in spirituality, self-exploration, and consciousness-raising which was then in vogue. Among all manner of cosmic, surreal adventures, the most extraordinary storyline culminated in Earth's destruction and, one second later, recreation, leaving the almost omnipotent Strange as the planet's only "original" inhabitant. Engelhart left after a couple of years, but the comic continued to be one of the more literate titles in Marvel's lineup for the rest of the decade. Evidently, as readers had grown up with their comics, the more introspective and thoughtful Doctor Strange stories resonated with their maturity. Presumably among those more mature readers were the television executives who commissioned a well-received made-for-TV movie in 1978, aptly titled Doctor Strange. Starring Peter Hooten, John Mills, and Jessica Walter, and written and directed by Phillip DeGuere, the movie was very true to the spirit of the comic, despite changing Doctor Strange's costume (indeed Frank Brunner, one of the main artists in the comic's revamp, contributed design work to the project). In 1979, Pocket Books published William Rotsler's Doctor Strange novel, Nightmare. In the more materialistic 1980s, on the other hand, there was apparently no place for subtlety or introspection, and so Strange spent much of that decade in cancellation. A revival in 1988 was characterized by an almost constant procession of changes, including Strange being stripped of most of his powers, losing one eye, and abandoning magic only to return to it three issues later. Many 1990s issues were peopled with monsters and vampires, and the comic became affiliated with Marvel's hard-hitting "Midnight Sons" storyline. Later innovations failed to prevent the comic's cancellation. Doctor Strange has kept appearing, if sporadically, ever since--in a miniseries for Marvel's mature-readers Marvel Knights line; as a benign spirit in the grim future fable Earth X; as a cold manipulator in the otherwise upbeat alternate-future MC-2 line; in a short-lived, tongue-in-cheek Defenders revival; as an aide to the Thunder God in the macabrely humorous Thor: Vikings miniseries; and elsewhere--which shows Marvel's fondness, if not always the market's enthusiasm, for this unusual character. In New Avengers #7 (July 2005) Doctor Strange was revealed to be a member of the Illuminati, a small, secret group of heroes who cope with threats to Earth; other members include Black Bolt, the Black Panther, Iron Man, Mr. Fantastic, Professor X, and Sub-Mariner, and recent additions Captain America and Medusa. Doctor Strange also became a member of the New Avengers. Doctor Strange stars in the direct-to-video animated film Doctor Strange: The Sorcerer Supreme (2007).